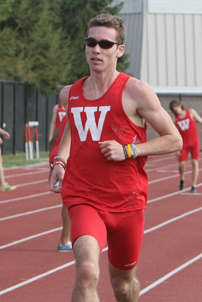 With a record number eight athletes set to compete this week at the 2012 NCAA Division III Outdoor Track and Field Championships, the Wabash College team will be provided its best opportunity to earn multiple All-America honors. Head Coach Clyde Morgan and Assistant Coach Roger Busch traveled to California on Monday with Kevin McCarthy, Jake Waterman, Daniel Ambrosio, Evan Groninger, Ronnie Posthauer, John Haley, Cole Hruskovich, Joel Whittington, and Sean Hildebrand. Posthauer's event, the 110-meter hurdles, will run preliminary rounds on Friday at 5:25 p.m. Waterman will race in the 800-meter run at 7:25 p.m.
Saturday Ambrosio and Groninger kick off the day with the javelin throw at 12:40 p.m. with athletes reaching the finals racing throughout the afternoon. All times listed are Pacific Daylight Savings Time. 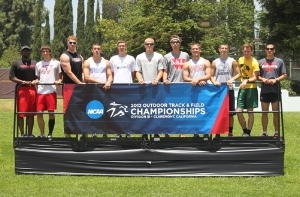 The national championship meet will be hosted by Claremont-Mudd-Scripps Colleges in Claremont. Live video of the meet is availablehere and live results can be tracked here. McCarthy (below left) is coming off a national championship performance in the indoor mile in March. He qualified for both the 1500 and the 3,000-meter steeplechase. However, due to the format of the meet and the difficulties involved in competing in both events, McCarthy will only run the 1500. The senior NCAA Postgraduate Scholarship recipient believes his victory in the mile in March can provide some extra confidence as he competes for the final time as a collegiate athlete. Waterman (below right) has finished second in the indoor 800-meter dash in back-to-back seasons along with a sixth place at last year's outdoor championship and a seventh-place finish in 2010. He enters this race with the fastest time among the 20 competitors, turning in a time of 1:48.64 at Indiana University in April. The four-time All-American, who will also run as a member of the relay team, has his mind set on crossing the finish line first at this year's meet. Ambrosio and Groninger each set school records this year in the javelin on their way to finishing 11th and eighth, respectively, in the regular season national rankings. Ambrosio's top throw came in the first meet of the season --- the J. Owen Huntsman Relays held in March at Wabash. Groninger also produced a good result at that meet, but his 62.90 meter mark at the North Coast Athletic Conference Championship Meet moved him into the top-ten in the nation and set the new school mark. The two will now compete together as part of the field of 20 athletes hoping to earn All-America honors. For Ambrosio, the success has come very quickly. Coming to Wabash as a quarterback on the football, he moved to track and field as a junior without ever competing in the javelin. He worked with Coach Morgan initial and discovered the same strengths and abilities that served him so well in football translated to the javelin throw. Posthauer was the last Little Giant to earn a berth in the national field. His time of 14.64 in the 110-meter hurdles came in the final qualifying meet of the season less than a week ago. One of two freshmen competing for Wabash at the meet, Posthauer is excited for the opportunity he has worked so hard reach. Haley and Hruskovich are the veterans for the Wabash in the relay. Haley competed at nationals on a relay team as a freshman when the Little Giants sent six athletes to the championship meet. 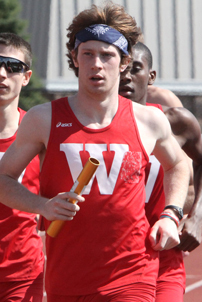 Hruskovich ran as part of the Wabash distance medley relay in March at indoor nationals. Wabash's time of 3:12.55 is third-fastest in the field of 16 teams, giving the squad hope for a good finish in both the prelims and finals. Whittington races for the first time at the nationals, but he served as an alternate on the distance medley relay team and observed the meet from the stands. He believes that experience can provide a boost heading into the weekend. Hildebrand will serve as an alternate for the relay team at this year's meet. Despite the fact he may not get the opportunity to race, the sophomore is ready to do whatever is needed to help the team succeed. With so many athletes competing for the Wabash, the Little Giants could post one of their highest finishes in the team competition in school history. Wabash enters the meet ranked eighth in the latest U.S. Track and Field and Cross Country Coaches Association computer listings. However, Morgan knows where the real focus lies. “We don't' have a team goal,” Morgan said. “We'll take every event one at time and at the end of the night on Saturday we'll see what happens. Even though the Little Giants won't place their focus on trying to earn a team finish in the top five overall, Busch believes the continued success of the program can put the Little Giants in place to reach that goal.